After you have activated Mobile Sync, you need to set up your account on a mobile device or in a client to make use of the synchronisation features. Note: You need to activate Mobile Sync (Exchange ActiveSync) separately for each email account. If Mobile Sync is not available in Webmail, then this has been disabled from the One.com control panel. Please contact the web space administrator to get it enabled on your account. Log in to Webmail and go to Settings, in the top menu. Click Mobile Sync, in the menu to the left. Click the Start free trial button to activate it. Note: If you want to keep using Mobile Sync after the trial has expired, the owner of the hosting subscription needs to approve it. An email will be sent to the contact email address with a link to turn the trial into a paid subscription. 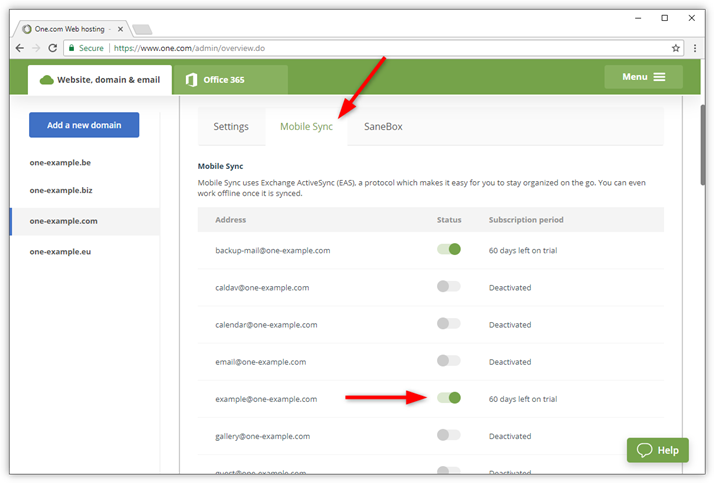 You can manage Mobile Sync for all email accounts on your domain from the One.com control panel under Mail Administration. Login to the One.com control panel and click Mail Administration. Under Accounts, click Mobile Sync. Enable Mobile Sync by moving the toggle under Status to the right. Click Start free trial to confirm. 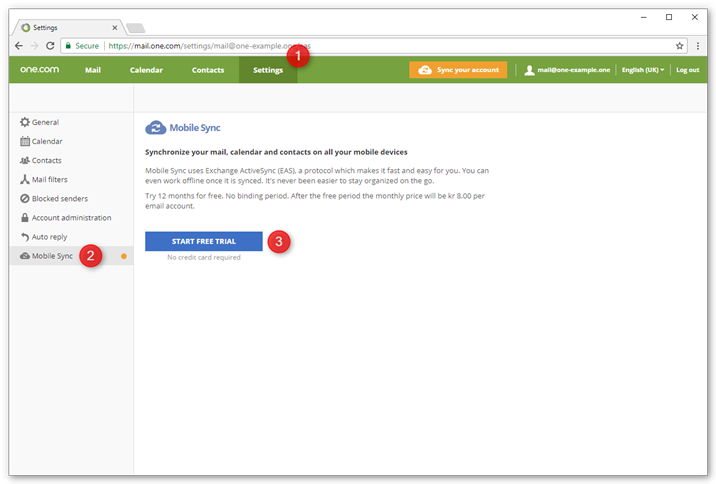 Note: If you have more than four email accounts created on your domain, you can disable the option to activate Mobile Sync from Webmail. This can be handy if you want more control over who can activate extra features. After you have activated Mobile Sync, you can set it up on your mobile device. Check out our step-by-step setup guides for more information. Tip: If you have previously set up your account with IMAP, you need to remove it and set it up again with Mobile Sync. Check our guide for more information: Change your email settings to Mobile Sync.